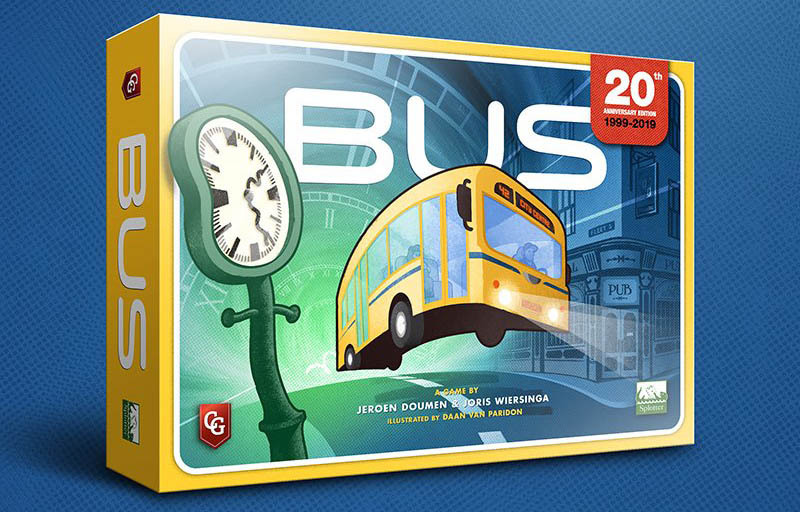 Paul: This year’s Spiel Des Jahres nominees are coming at us like hail in a windstorm. That’s to say SIDEWAYS and KIND OF PAINFULLY. Like HARD RAISINS. A HARD RAISINS’ A-GONNA FALL. Quinns: Well said, Paul! I can hardly tell you just had a big coffee. If you’re not aware, once a year this prestigious German prize is awarded by a jury of critics for “excellence in game design”. Because the winner of the Spiel des Jahres can sell up to half a million copies, it’s basically the only prize in board gaming that matters. You can see the past winners here. It’s now also tradition that every year Shut Up & Sit Down looks at the nominees and contort our faces into the kind of expression you might wear when checking if you’ve broken a toe. Paul: It’s not because we’re bad people (I mean, we are, but the connection isn’t causal and don’t you dare use that post hoc reasoning on me), it’s because the nominees are so often kind of… mild? The stuff we get excited about and the stuff the judges get excited about usually intersect about as much as the orbits of Mars and Mercury, with Spiel nominees often been very broad in appeal, which isn’t bad at all, but can mean some of them lack a certain spark. 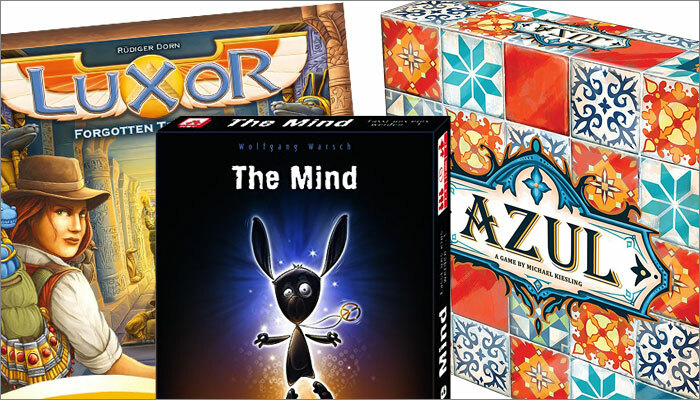 THAT SAID, this year one of my favourite games of 2017 is up, Azul, and we’ve been having an absolutely fantastic time playing the devilishly simple The Mind recently. How can a game so simple be so good? Pure genius, that’s how. And that does deserve recognition. Quinns: Yeah, it’s a good crop of nominees for the main prize this year! 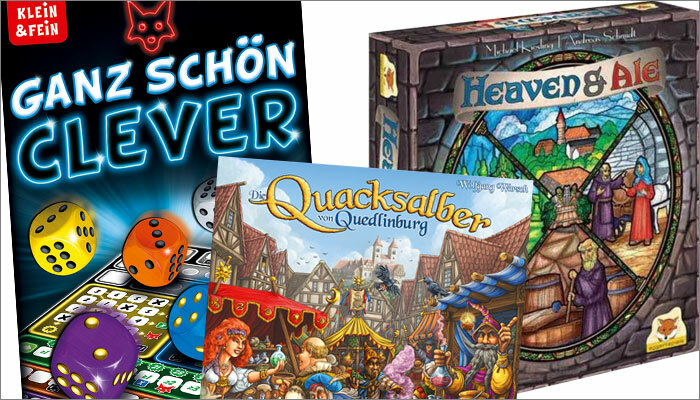 Although all three of the heavier Kennnerspiel (or “Connoisseur prize”) nominees are German games of middling acclaim. Of those we’ve played Ganz Schön Clever, a sweet little roll-and-write game, and it was good! It was nice. It was fun. But I think the board game scene might do well to admit that the Spiel jury are biased towards games of German origin, as well as that the nomination process is eccentric to the point of being inscrutable. Paul: Ganz Schön Clever was a neat dice-rolling game! It also came out the same year as Fugitive, if they want to celebrate smaller games (though, yes, I know that’s not made in Germany), or Bärenpark. OR SO MANY OTHER MIGHTY AND WONDERFUL THINGS LIKE TWILIGHT IMPERIUM 4 and GLOOMHAVEN and AAAAA. Quinns: Mm. It’s not exactly the Cannes Film Festival of board games, much as we all wish it was. Paul: AAAAA. More like the… can’t film a good documentary about this because… it is far too mild? 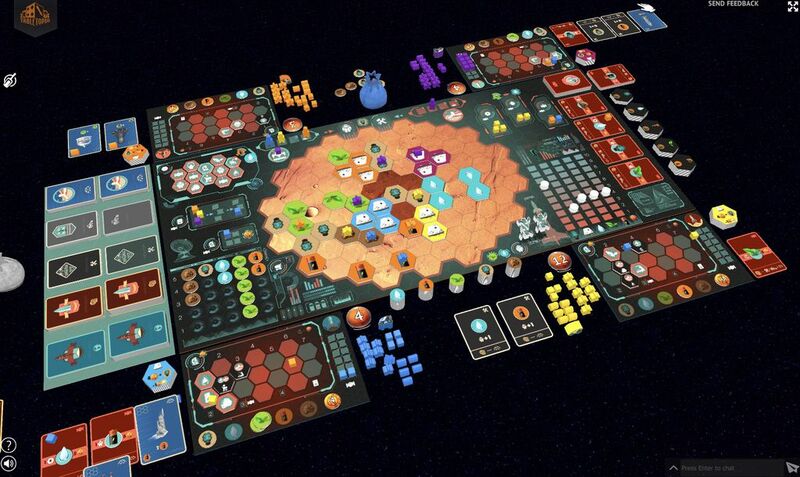 Chair of the awards Tom Felber published this article on why the games were chosen, which is enlightening and maddening in equal measure. Many games were eliminated for having a shoddy manual, which sounds like a smart way to go about things. But he also mentions that the profoundly average Memoarrr! was chosen because players will need a good memory, distinguishing it among the nominees. 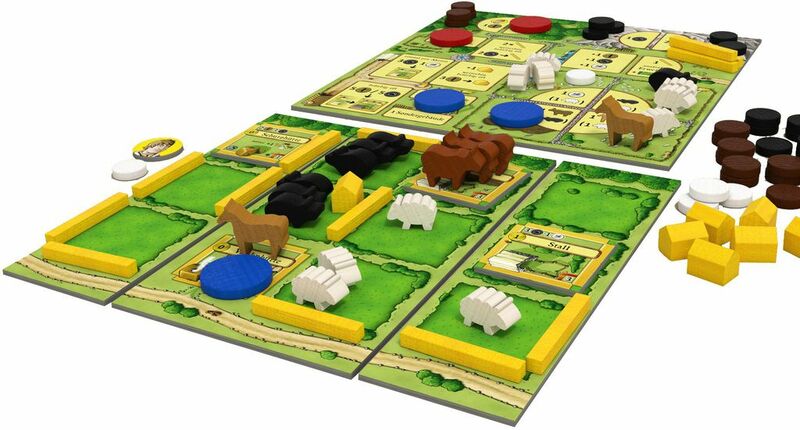 Paul: In other news, a reprint of the condensed, two-player version of Uwe Rosenberg’s Agricola known as All Creatures Great and Small is about to be birthed out of the braying stables at Lookout Games. 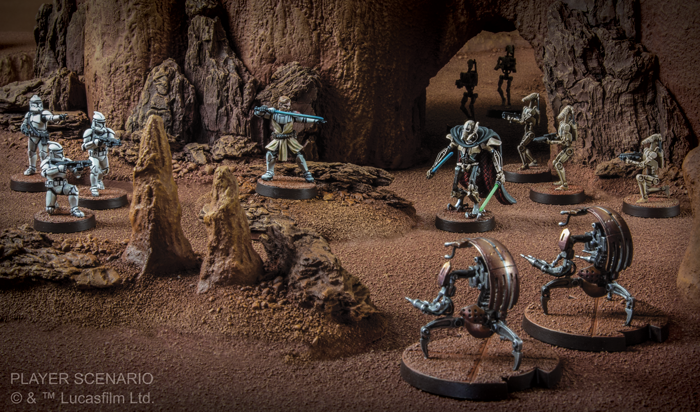 A “Big Box” edition is coming that contains both expansions and… you’re actually really keen to try it? Quinns: It might be the tightest, most distilled incarnation of Agricola! And it should be at the UK Games Expo! And you know what else is at the UK Games Expo? Us! Basically, you know that thing in Uwe Rosenberg games where you put two of the same animal in a pen and then a turn later you add a third animal, and then the next turn you have another animal? I think that’s magic. Quinns: I mean it’s like a magic trick. Where do the extra animals come from? Nobody knows. Not even Uwe. Paul: Not even the animals. Well, speaking of two-player experiences, the prolific Reiner Knizia is building upon what is considered one of the best 2 player titles out there, his well-loved Lost Cities. Enter Lost Cities: Rivals, which will transform that sacred duet into one that involves up to TWO MORE players. Unlike the passive aggressive Lost Cities of old, this is all about the selfish rush for fame, with everyone trying to become the best archaeologist and doubling down by putting wagers on their expeditions. I’m not quite sure how excited I am about this. Is it an unnecessary sequel to a popular classic? I can’t say I’m inspired as I read through the manual but, then again, some of Knizia’s is found in his apparently innocuous designs. 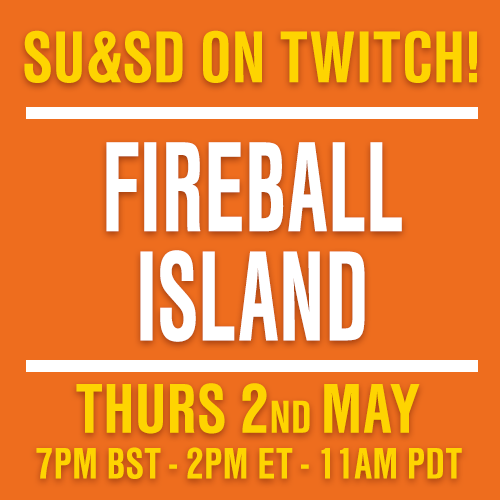 Quinns: I’m going to cruelly bundle these next two game announcements together. Portuguese designer Vital Lacerda, creator of such heavyweight table-busters as Vinhos, The Gallerist and Lisboa has announced On Mars, a game where up to four players will operate humanity’s first Martian settlements. 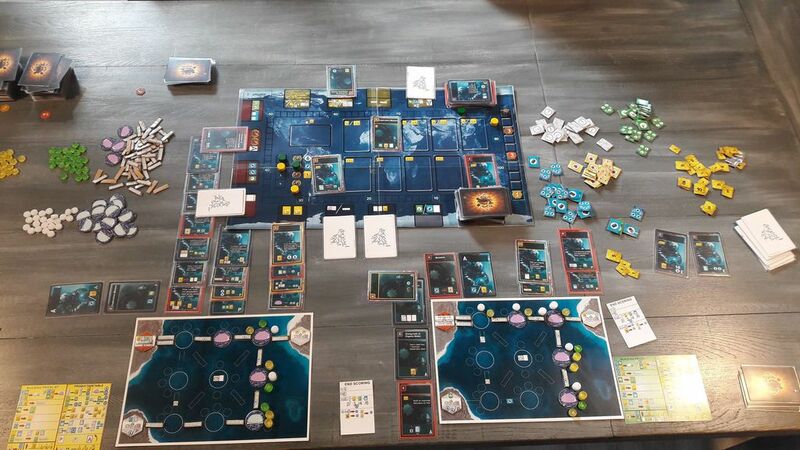 Meanwhile, Vladimír Suchý, Czech designer of such curious pieces as Last Will, The Prodigal’s Club and Pulsar 2849 has announced Underwater Cities, a game where up to four players will operate humanity’s first underwater cities. Paul: Are you excited for either one? Quinns: Hmm. I guess between The Martian, First Martians, Terraforming Mars and seeing Mars in The Expanse I could use a break from Mars. Paul: But a Mars a Day Helps You Work, Rest and Play. Quinns: Oh wow. With hindsight, what an ominous advertising campaign that was. Paul: You could optionally just have a third of a Mars and it’d just help you Rest. I think all the Mars Bars I’ve ever eaten were all made up of just those thirds. Quinns: While you were wittering just now I decided that I am kind of curious about Underwater Cities, but that’s a dull name. Also, the main board look quite bland. Are we ever going to get a Vladimír Suchý game that looks nice? Maybe the finished production of Underwater Cities will look nice. Paul: I like the idea of building a city underwater if exciting things might happen. Like crab attacks or invasions by bears in diving helmets with big harpoons. Quinns: Here’s a story we always meant to get around to and for which we had a terrific tip-off last year from reader Steve Dee. Yarn Quest is a… wait for it. Paul: I can see what it is because we are editing the Games News file and I don’t have to wait. Paul: Right after JRPG comes KRPG. 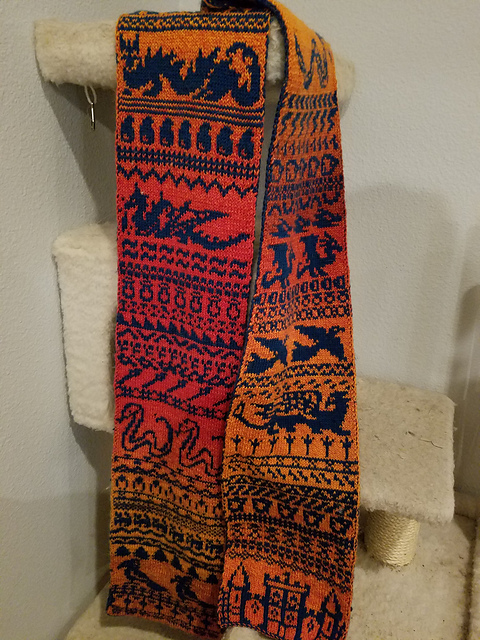 As the knitting continues, players end up with scarves that are almost like Bayeux tapestries, a visual record of their adventures. It’s both a journey and a prize, all at once. 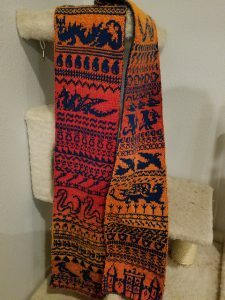 Above you can see one of the scarves from the 2017 quest. Those yarn specifications read like weapon statistics. Needle Size. Yardage. Effective Stopping Power. This kicked off at the start of the year. I wonder how it went? Just before we get into the Shut Up & Sit Down carriage, to ride off together to our very own Royal Wedding, from which we will gesture ambivalently towards the tumescent crowds of obsequious revellers who fawn endlessly over our lackadaisical procession, we should link you to what I guess must be The Official Shut Up & Sit Down Soundboard. YES, THAT’S RIGHT. Good work, hamiltonianurst. Quinns: Paul this is some swears. Paul: It’s not all swears. The ones that people click on the most get pushed to the top. 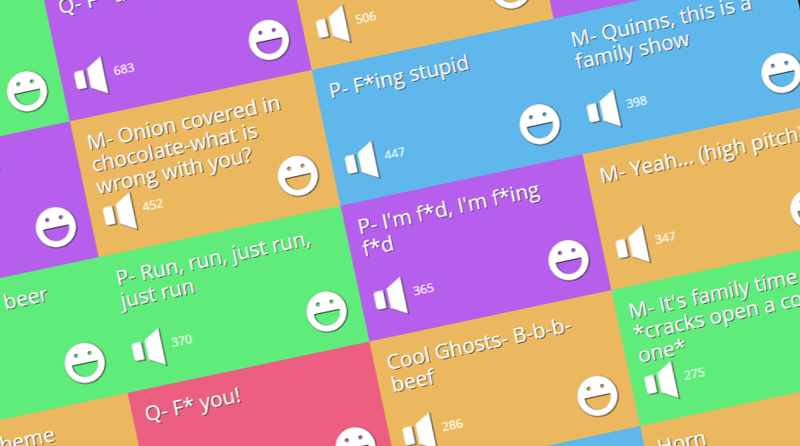 So the swears get pushed to the top. It’s a self-perpetuating cycle. Paul: Our viewers just have very rude taste.